When you work with variety meats such as chicken gizzards, you have a lot of fibrous, tough tissue to contend with. You have to break down that tough tissue before using a dry-heat cooking method like frying to prepare them, and this can take hours if you go the low-temperature, slow-cooking route. A better alternative exists in pressure-cooking. Pressure-cookers break down a gizzard in less than 30 minutes. Never try to fry gizzards in a pressure-cooker, though, because boiling oil will melt the gaskets and spray from the pressure valve and lid. Place a gizzard on the work surface so you can see the equatorial diagonal seam that runs around it. Position the blade of the fillet knife on the seam and slice the gizzard in half. Submerge the gizzard halves in a bowl of water. Run your fingers through the grooves on the inside and outside of the gizzard and dislodge the debris and grit. Return the gizzard halves to the work surface and cut the lip of tissue that runs around the edges of the halves. Position one of the gizzard halves on its side and slice off the grinder plate, a 1/4-inch-thick piece of tissue that helps the chicken grind seeds. You should see only dark red meat on the inside of the gizzard after you slice off the grinder plate. Repeat with the other gizzard half. Insert the tip of the knife under the silverskin, the thin sheath of iridescent connective tissue covering the gizzard. Slice the silverskin off both of the gizzard halves. Trim off all the white, bumpy rubbery tissue. The gizzard should be a pure maroon mass of meat when you finish cleaning and trimming it. Rinse the gizzards under running water. Place the cleaned gizzards in the pressure cooker, along with at least 1 1/2 cups of stock or water. Secure the lid on the pressure cooker and place it on the stove. Set the heat under the pressure-cooker to high and let the cooker build pressure. 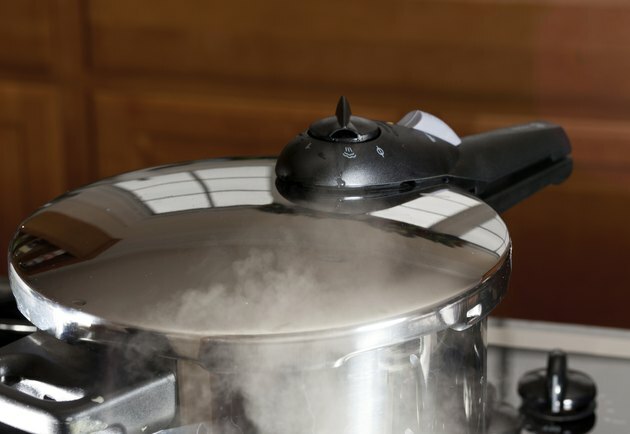 Some pressure-cookers have a metal jiggler that rocks back and forth in the pressure valve on the lid; when the jiggler jiggles two to three times a minute, the cooker has reached cooking pressure. Adjust the heat as needed to maintain cooking pressure. If your cooker has a valve stem that rises as pressure builds, wait until it reaches 15 psi and adjust the heat to maintain it. Cook the gizzards for 25 minutes. After that time is up, take the pressure-cooker off the stove and let the pressure dissipate naturally. The gizzards still cook during the cool-down period. Remove the cover from the cooker when the pressure dissipates. Most pressure cookers unlock only when the pressure dissipates fully. Take the gizzards from the pressure cooker and let them cool to room temperature. Pat the gizzards dry before frying them. Supermarket gizzards are usually already cleaned. Refer to the pressure cooker's instructions for detailed information about how to use your specific model.